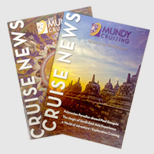 YOUR CONTRACT IS WITH MUNDY CRUISING PLC, a Member of ABTA, trading as Mundy Cruising or Mundy Adventures. The company number is 989609, and the registered office is 35 Ballards Lane, London N3 1XW. When you make a booking you guarantee that you have the authority to accept and do accept on behalf of your party the terms of these booking conditions. A contract will exist as soon as we issue our confirmation invoice. This contract is made on the terms of these booking conditions, which are governed by English Law, and the jurisdiction of the English Courts. You may however choose the law and jurisdiction of Scotland or Northern Ireland if you live there and wish to do so. 1. We provide full financial protection for our package holidays, by way of our Air Travel Organiser's Licence number . When you buy an ATOL protected flight or flight inclusive holiday from us you will receive an ATOL Certificate. This lists what is financially protected, where you can get information on what this means for you and who to contact if things go wrong. We are a Member of ABTA, membership number 80518. We are obliged to maintain a high standard of service to you by ABTA's Code of Conduct. We can also offer you ABTA's scheme for the resolution of disputes which is approved by the Chartered Trading Standards Institute. If we can't resolve your complaint, go to www.abta.com to use ABTA's simple procedure. Further information on the Code and ABTA's assistance in resolving disputes can be found on www.abta.com. 2) When you make your booking you must pay a deposit which will be advised at the time of booking. The balance of the price of your travel arrangements must be paid at least 12 weeks before your departure date. In some instances, the balance is due earlier. The balance due date for your particular booking will be confirmed on your invoice. If the deposit and/or balance is not paid in time, we shall cancel your travel arrangements. If the balance is not paid in time we shall retain your deposit. The price of your travel arrangements was calculated using exchange rates available at the time of booking. 3) Changes in transportation costs, including the cost of fuel, dues, taxes or fees chargeable for services such as landing taxes or embarkation or disembarkation fees at ports and airports and exchange rates mean that in exceptional circumstances the price of your travel arrangements may change after you have booked. However there will be no change within 30 days of your departure. We will absorb and you will not be charged for any increase equivalent to 2% of the price of your travel arrangements, which excludes insurance premiums and any amendment charges. You will be charged for the amount over and above that, plus an administration charge of £1 per person together with an amount to cover agents' commission. If this means that you have to pay an increase of more than 10% of the price of your travel arrangements, you will have the option of accepting a change to another holiday if we are able to offer one (we will refund any price difference if the alternative is of a lower value), or cancelling and receiving a full refund of all monies paid, except for any amendment charges. Should you decide to cancel: 1) you must do so within 14 days from the date on your final invoice 2) We will provide a refund of insurance premiums paid to us if you can show that you are unable to transfer or reuse your policy. Should the price of your holiday go down due to the changes mentioned above, by more than 2% of your holiday cost, then any refund due will be paid to you. However, please note that travel arrangements are not always purchased in local currency and some apparent changes have no impact on the price of your travel due to contractual and other protection in place. If, after our confirmation invoice has been issued, you wish to change your travel arrangements in any way, for example your chosen departure date or accommodation, we will do our utmost to make these changes but it may not always be possible. Any request for changes to be made must be in writing from the person who made the booking or your travel agent. You will be asked to pay an administration charge of (£50 ), and any further cost we incur in making this alteration. You should be aware that these costs could increase the closer to the departure date that changes are made and you should contact us as soon as possible. Note: Certain travel arrangements (e.g. Apex Tickets) may not be changeable after a reservation has been made and any alteration request could incur a cancellation charge of up to 100% of that part of the arrangements. You, or any member of your party, may cancel your travel arrangements at any time. Written notification from the person who made the booking must be received at our offices. Since we incur costs in cancelling your travel arrangements, you will have to pay cancellation charges which will be advised at the time of booking. As we plan your holiday arrangements many months in advance we may occasionally have to make changes or cancel your booking and we reserve the right to do so at any time. Changes If we make a major change to your holiday, we will inform you as soon as reasonably possible if there is time before your departure. You will have the choice of either accepting the change of arrangements, accepting an offer of alternative travel arrangements of comparable standard from us if available (we will refund any price difference if the alternative is of a lower value), or cancelling your holiday and receiving a full refund of all monies paid. In some cases we will also pay compensation (see below). These options don't apply for minor changes. Examples of minor changes include alteration of your outward/return flights by less than 12 hours, changes to aircraft type, change of accommodation to another of the same or higher standard, changes of carriers. Please note that carriers such as airlines used in the brochure may be subject to change. Cancellation We will not cancel your travel arrangements less than 8 weeks before your departure date, except for reasons of force majeure or failure by you to pay the final balance. We may cancel your holiday before this date if, e.g., the minimum number of clients required for a particular travel arrangement is not reached. If your holiday is cancelled you can either have a refund of all monies paid or accept an offer of alternative travel arrangements of comparable standard from us, if available (we will refund any price difference if the alternative is of a lower value).In some cases we will pay compensation (see below). Insurance If we cancel or make a major change and you accept a refund, we will provide a full refund of your travel insurance premiums if you paid them to us and can show that you are unable to transfer or reuse your policy. Compensation If we cancel or make a major change we will pay compensation except where the major change or cancellation arises due to reasons of force majeure. The compensation that we offer does not exclude you from claiming more if you are entitled to do so. If you have a problem during your holiday, please inform the relevant supplier (e.g. your hotelier) and our resort representative immediately who will endeavour to put things right. If your complaint is not resolved locally, please follow this up within 28 days of your return home by writing to our Customer Services Department at 50-51 Wells Street, London W1T 3PP giving your booking reference and all other relevant information. Please keep your letter concise and to the point. It is strongly recommended that you communicate any complaint to the supplier of the services as well as to our representative without delay and complete a report form while you are away. If you fail to follow this simple procedure we will have been deprived of the opportunity to investigate and rectify your complaint whilst you were in resort and this may affect your rights under this contract. Please also see clause 3 above on ABTA. You can ask for copies of the transport contractual terms, or the international conventions.. Under EU law (Regulation 261/2004) you have rights in some circumstances to refunds and/or compensation from your airline in cases of denied boarding, cancellation or delay to flights. Full details will be publicised at EU airports and available from airlines. However reimbursement in such cases will not automatically entitle you to a refund of your holiday cost from us. Your right to a refund and/or compensation from us is set out in clause 7. If any payments to you are due from us, any payment made to you by the airline will be deducted. These are the terms on which Mundy Cruising Plc, trading as Mundy Cruising or Mundy Adventures will make a booking for your travel or holiday requirements. The company number is 989609, and registered address 35, Ballards Lane, London N3 1XW. We are a member of ABTA, membership number 80518. If your receipt shows that the ATOL holder is Mundy Cruising, ATOL number 2980, different terms and conditions may apply (depending on whether we are the package operator or are organising a flight plus holiday), which can be found on our website www.mundycruising.co.uk. Please ask us for a copy if you would like one. When making your booking we will arrange for you to enter into a contract with the principal(s) or other supplier(s) (e.g. tour operator/airline/cruise company/accommodation company) named on your receipt(s). We can book you a package holiday, in which case you will have one contract with the principal, or we can book the services that make up your holiday with different principals or suppliers, in which case you will have separate contracts with each of them. As agent we accept no responsibility for the acts or omissions of the principal(s) or supplier(s) or for the services provided by them. The principal's(s') or supplier's (s') Terms & Conditions will apply to your booking and we advise you to read these carefully as they do contain important information about your booking. Please ask us for copies of these if you do not have them. Our Terms of Business are governed by English Law and the jurisdiction of the English Courts. You may however, choose the law and jurisdiction of Scotland or Northern Ireland if you wish to do so. All travel arrangements which we provide or which are sold through us are not an offer by us to sell any travel arrangements, but an invitation to you to make an offer to the suppliers of the arrangements. We are free to accept that offer on behalf of those suppliers or to reject it. When a booking is made all details will be read back to you. Once you have confirmed these details we will proceed to confirm the booking with the principal(s) or supplier(s). Please check that all names, dates and timings are correct on receipt of all documents and advise us of any errors immediately. Any changes to these details will incur the charges stated below. Please ensure that the names given are the same as in the relevant passport. The booking information that you provide to us will be passed on only to the relevant suppliers of your travel arrangements or other persons necessary for the provision of your travel arrangements. The information may therefore be provided to public authorities such as customs or immigration if required by them, or as required by law. This applies to any sensitive information that you give to us such as details of any disabilities, or dietary and religious requirements. Certain information may also be passed on to security or credit checking companies. If you are travelling to the United States, the US Customs and Border Protection will receive this information for the purposes of preventing and combating terrorism and other transnational serious crimes. If you travel outside the European Economic Area, controls on data protection may not be as strong as the legal requirements in this country. If we cannot pass this information to the relevant suppliers, whether in the EEA or not, we will be unable to provide your booking. In making this booking, you consent to this information being passed on to the relevant persons. Full details of our data protection policy are available upon request. You will be required to pay a deposit or make full payment for your booking at the time of booking. Where you only pay a deposit you must pay the full balance by the balance due date notified to you. If full payment is not received by the balance due date, we will notify the principal(s) or supplier(s) who may cancel your booking and charge the cancellation fees set out in their Terms and Conditions. Any cancellation or amendment request must be sent to us in writing and will not take effect until received by us. If you cancel or amend your booking the principal(s) or supplier(s) may charge the cancellation or amendment charge shown in their Terms and Conditions (which may be 100% of the cost of the travel arrangements) and you must pay us the cancellation or amendment charge stated below. 1) Many principals/suppliers require you to take out travel insurance as a condition of booking with them. In any event, we strongly advise that you take out a policy of insurance in order to cover you and your party against the cost of cancellation by you; the cost of assistance (including repatriation) in the event of accident or illness; loss of baggage and money; and other expenses. If we have issued your policy please check it carefully to ensure that all the details are correct and that all relevant information has been provided by you (e.g. pre-existing medical conditions). Failure to disclose relevant information will affect your insurance. All the package and Flight-Plus holidays we sell come with protection for your money. If you buy a single travel service then this might not apply. Package holidays are protected by the package organiser and we will provide you with their confirmation. Our Flight-Plus holidays are ATOL- protected (our ATOL number is 2980). A Flight-Plus is where you purchase through us, at the same time or within a day of each other, a flight plus overseas accommodation and/or car hire from separate suppliers (i.e. not a package holiday). When you buy an ATOL protected flight or flight inclusive holiday from us you will receive an ATOL Certificate. This lists what is financially protected, where you can get information on what this means for you and who to contact if things go wrong. On all Flight Plus holiday arrangements, your money is ATOL protected meaning that you will be able to continue with your holiday or receive a refund of the amount paid to us in the unlikely event of our insolvency or the insolvency of your service providers. Please note however that we have no liability beyond that for insolvency as set out in the ATOL scheme, because we act as agent of the suppliers. We or the suppliers of the services you have bought will provide you with the services you have bought (or a suitable alternative). In some cases, where neither we nor the supplier are able to do so for reasons of insolvency, an alternative ATOL holder may provide you with the services you have bought or a suitable alternative (at no extra cost to you). You agree to accept that in those circumstances, the alternative ATOL holder will perform those obligations and you agree to pay any money outstanding to be paid by you under your contract to that alternative ATOL holder. However, you also agree that in some cases it will not be possible to appoint an alternative ATOL holder, in which case you will be entitled to make a claim under the ATOL scheme (or your credit card issuer where applicable). All documents (e.g. invoices/tickets/Insurance policies) that require to be posted will be sent to you by First Class post. Once documents leave our offices we will not be responsible for their loss unless such loss is due to our negligence. If tickets or other documents need to be reissued all costs must be paid by you. You can ask for delivery by other means subject to the charges stated below. We will provide general information about the passport and visa requirements for your trip. Your specific passport and visa requirements, and other immigration requirements are your responsibility and you should confirm these with the relevant Embassies and/or Consulates. Neither we nor the principal(s) or supplier(s) accept any responsibility if you cannot travel because you have not complied with any passport, visa or immigration requirements. Most countries now require passports to be valid for at least 6 months after your return date. Please take special note that for all air travel within the British Isles, airlines require photographic identification of a specific type. Please ask us for full details. We can provide general information about any health formalities required for your trip but you should check with your own doctor for your specific circumstances. Credit card charge - Amex 1.95%. 1.1 This website mundyadventures.co.uk (the "Site") is provided and operated by Mundy Cruising plc ("we", "us" or "our"). 1.2 Your use of the Site is subject to these website terms and conditions ("Website Terms") which tell you the basis on which you may make use of the Site. 1.4 We may amend these Website Terms at any time by posting the amended terms on the Site. All amended terms will automatically take effect immediately on posting. Please check these Website Terms periodically to inform yourself of any changes. In continuing to use the Site you confirm that you accept the then current Website Terms in full at the time you use the Site. 2.1 We are Mundy Cruising plc, a company registered in England and Wales at Companies House. Our registered office is 35 Ballards Lane, London, N3 1XW and our registered number is 989609. 2.2 You can contact us by email at sales@mundyadventures.co.uk or on +44(0)20 7399 7630. We have made this Site available to you for your own personal non-commercial use. We may modify, withdraw or deny access to this Site at any time. 4.1 The Site and all of its contents including, without limitation, all text, software (including source codes), trademarks, logos, designs, images, photographs, audio visual materials, written materials and any other form of material ("Website Content") is owned by us or licensed to us by third parties. The copyright and all other intellectual property rights in all Website Content (whether registered or unregistered) is owned by us or our licensors. Any rights or licences of the Website Content not expressly granted by these Website Terms are reserved. 4.2.4 the person to whom you provide these materials is made aware of these restrictions. 4.3 You may not systematically extract and/or re-utilise parts of the Website Content without our express written consent. In particular, you may not utilise any data mining, robots, or similar data gathering and extraction tools to extract (whether once or many times) for re-utilisation any substantial parts of this Site without our express written consent. 4.4 In the event that you are found by us to have breached the terms of this clause 5 then we reserve the right to terminate without notice your use of the Site without limiting any other rights and remedies we may have. 5.1 We do not guarantee that the Site will be compatible with any hardware or software which you may use. 5.2 We do not warrant that the Site will be uninterrupted or error free. 5.3 The Site is provided on an "as is" basis without warranties of any kind, either express or implied, including, but not limited to, warranties of title or implied warranties of merchantability or fitness for a particular purpose, other than those warranties which are implied by and incapable of exclusion, restriction or modification under the laws of England and Wales. 6.1 The information contained on the Site is given for general information and interest purposes only. We shall not be liable, regardless of the cause or duration, for any errors, inaccuracies, omissions, or other defects in, the information contained within the Site (including the reliance upon any such information). 6.2 We accept no liability for viruses and you are advised to take all appropriate safeguards before downloading information or images from the Site. Pricing displayed on this site is based on a per person basis using the lowest grade of accommodation and are subject to availability and change. A tailor-made quotation will be provide at the time of your enquiry.